We arrived safely back to our cabina home Saturday evening from our time at the Arenal Observatory Lodge. Of the places I have seen, this has to be on the list as a paradise. I hope to post more details and picture from that experience soon. Right now my heart is processing two contrasting experiences here, and how they symbolize the faces of our journey in a nutshell. First, the bump. Thursday morning I was getting ready in the bathroom and planning out how to share some of my testimony with the Hogar de Vida family at morning devotions. I was leaning in close to the steamy mirror, applying a bit of make-up when I heard the sound of tiny claws. Half of the many appendages of a large scorpion began flailing from behind the side of the mirror at eye level. Calling out frenzied prayers and trembling like a leaf, I leapt for a large drinking cup–my weapon of choice for dealing with undesirable characters in the house. The strategy is simple: imprison the intruder under the cup, slip a piece of stiff paper underneath it to box it inside, and carry the offending insect outdoors. It sounds very compassionate, but the real goal is keeping a safe distance away from things that go “sting.” This time I only had access to about half of the unsavory character. I pinned him to the wall, but for the sake of photography, didn’t want to squish/saw him completely in half. Matt removed the mirror from the wall for me, but I didn’t let him intercept the conflict. This was my battle and I knew I needed to face it. 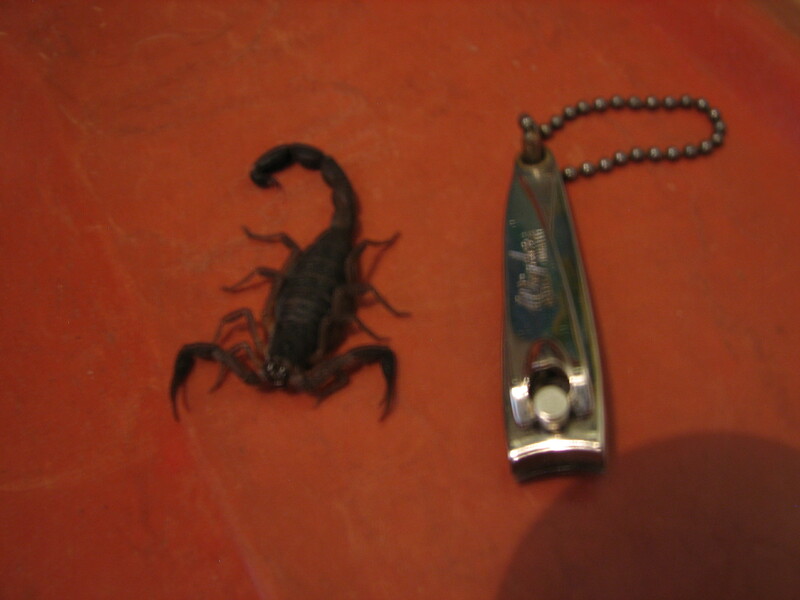 With the help of a tube of girl-stuff, I got the scorpion lifted over the sink and onto the floor, safely under the cup. Shaken but victorious, I began to pray over that cup and the adrenaline coursing through me. I don’t think it was a coincidence that I had to face one of my biggest fears about living in Costa Rica minutes before trying to share my heart with the people here. When I checked under the cup, my new friend had checked out. Either I had squished him more than he could handle, or I prayed him to death. We didn’t mourn much, but we did take a few pictures for posterity’s sake. 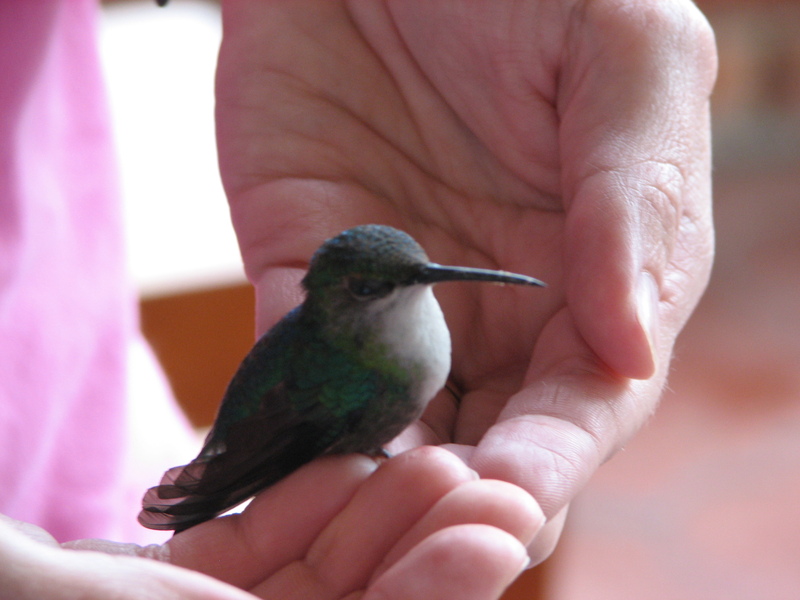 The blessing took place on the front porch of our shared cabin at the Arenal Observatory Lodge. We had a terrific view of the Arenal Lake, the fragrance of gorgeous landscaping, and the chorus of many varieties of magnificent birds. Humming birds came in close to feed on flowers right in front of us, and one must have gotten confused. As we enjoyed our quiet time, a small thunk by the window drew our immediate attention. A sweet little jewel of a bird lay twitching on the concrete. After about 30 seconds wondering whether I would frighten it to death, I scooped it up into my hands to keep it warm. Tiny feet grasped my skin and held tight as the dear little thing sat up and blinked the grog out of her noggin. I was able to hold the blessing of a lifetime for about 5 minutes, admiring the green fire painted on each tiny feather, until with a whir of wings she was gone. 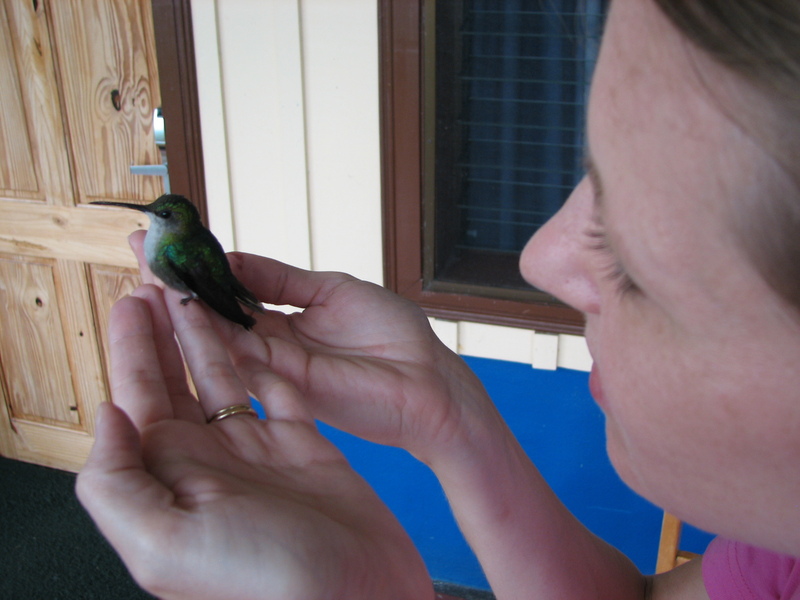 Being in Costa Rica for this 5-week trip and working towards a full-time ministry here in the future has plenty of hummingbird moments. Eliana feeling comfortable enough to go upfront and dance with a friend during worship today. Kind comments and encouragement from friends and family here on our blog. Seeing a tia and some of her house children slip-n-sliding in the rain yesterday with a long piece of black landscaping plastic and some dish soap. These are the things that make for good blog posts. I try to share them so that they will uplift others as the Lord is uplifting me. But to be honest, this journey also has its share of scorpion moments. The language barrier keeping me from being able to understand a hurting tia’s prayer request. Homesickness for our family, friends, church, and culture. The weight of having to sell our beloved house without any good idea of what we will be able to rent for our family’s future nest. I never realized before how attached I was to air conditioning and sleeping in the quiet of a room with closed windows. Matt’s heart is full steam ahead in this calling. I often have a fair supply of “can do,” but find myself running short on “want to” at times. I won’t camp out here, but I want to confess that I’m not perfect and this walk can be difficult. It’s why we need people to link arms with us in prayer covering and support. His power is being made perfect in my weakness. Perhaps He is holding me tenderly like a dazed hummingbird, enjoying the closeness yet waiting for the moment when my wings are able to take flight. This entry was posted in Costa Rica, Kris' Heart and tagged arenal observatory lodge, blessing, bump, Cost Rica, hummingbird, living in costa rica, scorpion. Bookmark the permalink. God has a calling for everyone in this world and some listen to what He has for them. From experience, the journey isn’t always easy but it is so worth it to be in the center of God’s will for your life. My prayer for you is as you have scorpion and hummingbird moments that you will keep in mind the purpose God has for your life. He will give you grace as you go and even after a scorpion day you can say, “God you called me so help me make it through” knowing that He is there holding your hand. Oh Kris, so beautiful today. Your heart is open, and my heart is hovering with you, knowing when those wings are able, you will spread such sweetness in His name, and for His Kingdom. Love you. Thank you for sharing and encouraging me with your courage! This has been so inspiring to me this morning. I came upon your blog after seeing the discovery post for the craigslist add. God has called us to colorado springs with one of the pasors from Bridge church, to help start a new church and amazing movement of God. There are so many uncertainties, and sometimes my faith is super charged and other times I start to look at the details and wonder “can this really work”. He’s made the way and calling clear so I know He will guide us and provide all that we need. Thanks so much for you honesty and for writing out your heart. Your family will be in our prayers.